Hard criteria can be used for matching Candidates with Jobs, and Job alert subscribers with Jobs of their interests. Hard criteria are key terms like Field of education or Language skills. So, their is a match if a Candidate possesses the language skill "Spanish" and the Job has a hard criteria "Spanish". In the following section, a step-wise explanation will be provided on how to create or edit these hard criteria. The second section will provide some information on where and how to use hard criteria. How to create or edit hard criteria? Open the tab "Connexys Resource Manager Setup"
Select the component "Hard criteria" in the section "Basic setup". Click the button "New Hard criterium type" to create a new hard criterium or click "Edit" in front of an existing hard criterium to make adjustments to that criterium. For adjustments in translations or the values for a specific hard criterium, proceed to list point 8. Fill this field with the title this hard criterium should have (e.g. Education level or Career level). 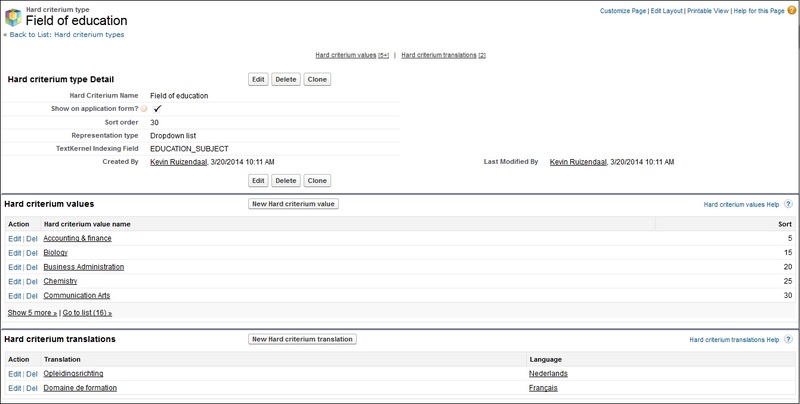 TextKernel Search makes it possible to match candidates with jobs based on hard criteria. To be able to use the new created hard criterium in the search, it is necessary to link it with a criterium as TextKernel knows it. Among the possible options are LANGUAGESKILLS, HOBBY and CAREER_LEVEL. When enabled Hard Criteria will be showed on CV generator and in the Proposal Portal. 7. Click "Save" or "Save & New" to save it and create another one. 9. In the second section, it is possible to enter the values that should be available for this hard criterium. Once an applicant has selected Computer Science on his application form, the match percentage will rise. This will assist in finding the best suitable candidate for the job. To add a value, click the button "New Hard criterium value". Hard criterium value name: Enter the name of the value (e.g. Bachelor in the hard criterium "Education level" or Senior in the hard criterium "Career level"). Hard Criterium Type: Once a value is created right from the hard criterium, this field is automatically filled. Otherwise, select the hard criterium for which this value should be created. 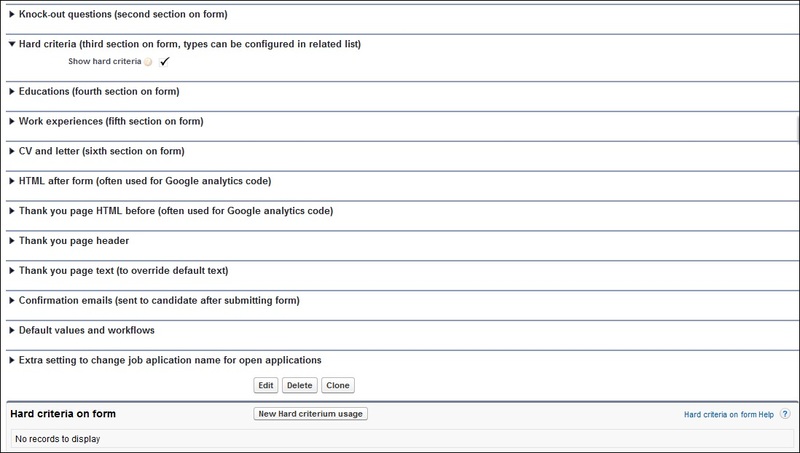 Sort: Provide a number to configure the order in which the values should be shown on the application form. 11. Click "Save" or "Save & New" to create another one. 12. Translation of the hard criteria can be done in the third section in the hard criterium file "Translations". Click "New hard criterium translation" at the top of that section. Translation: Enter the text of the translation. Hard Criterium Type: Again, this field is already filled if the translation is created from the hard criterium. Otherwise, select the value of the hard criterium this translation is for. Language: Select the language of the translation. 14. Click "Save" to create the translation or "Save & New" for another translation. 15. To translate the values that have been created for a hard criterium, click the specific value that needs to be translated from the section "Values" in the hard criterium file. After that, go to the section "Translations" in the hard criterium value file and click the button "New Hard criterium value translation". Where and how to use hard criteria? One of the sections on the Job file is the section "Hard criteria", see image below. When clicked on the "Hard criteria" at the top of the screen, the screen will scroll down to the section in the job file. This section is shown in the following screenshot. Here, five hard criteria are linked to this job file. They indicate that this organisation is looking for a candidate that has a Master's degree, 3-5 years of working experience, willing to work full-time in Marketing / Product and for a salary of 35,000 - 50,000 dollar. The user can add more existing hard criteria to the job by use of the button "Change hard criteria" at the top of the section. Thereby, All hard criteria have the same weight and are therefore seen as equally important. These hard criteria will be shown on the application form for candidates to fill out (if enabled in "Forms"). It is also possible to add hard criteria to job templates. In the screenshot below is an example given of how hard criteria can look like in a job template. This job template has only one hard criterium, a candidate that is willing to work full-time. Every job created from this template shall automatically contain this hard criterium. After filling out an application form, it is possible that a Candidate has indicated which hard criteria apply to him/her. These hard criteria will then be saved in the candidate file. Based on the hard criteria in the candidate file and the hard criteria in the job file, matching can be executed. As can be seen below, there is a section that contains the hard criteria. This candidate has a PhD, over 5 years of working experience and he is looking for a function in the category "Administrative / Clerical". New hard criteria can be added by the use of the button "Change hard criteria". To send a Job alert with suitable, matching Jobs to subscribers, the candidates/job alert subscribers need to have something in common with the jobs. Therefore, there is a possibility for subscribers to select hard criteria on the Job alert registration page (see print screen below). (On the job alert page the hard criteria are always shown as checkboxes). To show hard criteria on the application form of a job or job alert, the section on hard criteria must be enabled for the used application form. This can be done in the settings of the specific form, by checking the checkbox "Show hard criteria" (see screenshot below). 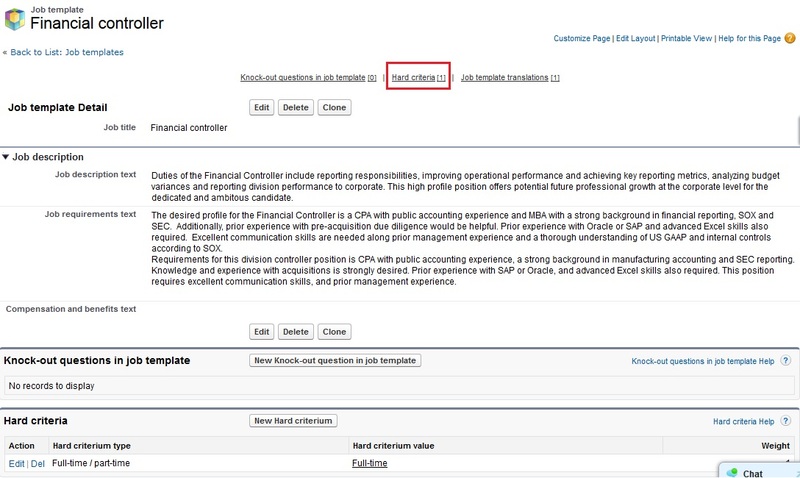 This option shows the hard criteria that are attached to a job or job alert, but only if the checkbox is also checked in the configuration of the hard criterium (as was described in the section "How to create or edit hard criteria?"). Another option is to always add a specific hard criterium to the form (whether or not it is used in the job). Therefore, the section at the bottom of the application form can be used. By clicking the button "New Hard criterium usage", it is possible to link a hard criterium to the form or make it mandatory. Note: if there are hard criteria filled in the section at the bottom of the screenshot below, the hard criteria in the job file will not be shown, regardless of the checkbox "Show hard criteria" being checked. Based on this, the recruiter can match the job applications or candidates in the database and find the best suiting candidate(s) for this job. (On the application form you can decide how the hard criteria are shown; Dropdown list, Multiple select and Checkboxes). When using Match hard criteria are used to query Textkernel Search. This way hard criteria defined on the job are matched against candidates who have these criteria filled on the form. Dit artikel vertelt me helaas niet wat de betekenis is van / hoe de weegfactor werkt. Je ziet bij criteria standaard een 1 of 2 staan. Wat kan ik hiermee? De weegfactor werkt op basis van relevantie. - Stel, er zijn drie harde criteria, die allemaal weegfactor 1 hebben. Dan wegen ze allemaal voor 33,3% van het totaal mee. - Stel, er zijn vijf harde criteria, twee met weegfactor 1 en drie met weegfactor 2, dan weegt de harde criteria met weegfactor 1 voor 12,5% mee en de harde criteria met weegfactor 2 voor 25%. In what way do the weight values for hard criteria work? Weight values are based on the principle of relevancy. - In case there is a number of three hard criteria, each with the weight valued at 1, they will each weigh for 33.3% of the 100% total. - In this example we have 5 hard criteria. Two of those hard criteria have been given a weight of 1, the other three a weight of 2. The hard criteria with weight value 1 will each make up for 12,5% of the 100% total, whereas the hard criteria with weight value 2 will make up for 25% each.